Is the answer to India’s hungry stomachs, chikki? The food security bill is the next big social welfare item on the UPA menu as it hurtles towards elections. The idea is unexceptionable, to use India’s surplus and rotting foodgrains to feed the poor, hungry and malnourished. And the hope is that like NREGA, free food and direct cash transfer will win a third term for the Congress-led coalition. Except that food is a state subject, except that the opposition isn’t playing ball, except that it can get all very messy. Also, in a large and diverse country with differing tastes every mile of the way, there is the question of what to give the needy. 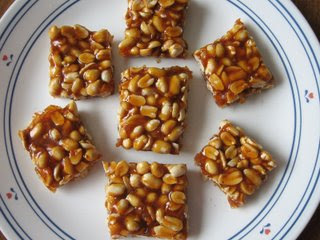 The economist Ashok V. Desai suggests chiki or chikki, what passes off as kadalekaayi mithai in Karnataka. “We need an eatable that is durable, light and solid. The only such Indian eatable I know is chiki. It is common in Maharashtra; as trains run between Bombay and Poona, young men cling to the windows and sell packets of chiki to passengers. The chiki they sell is peanuts or sesame seeds embedded in gur (unrefined sugar). “One gets variants of chiki all the way north; in Delhi, they are a seasonal ware sold in winter by rehriwallahs (hand-cart pushers) who sell murmura (parched rice), chana (parched gram) and bhel (a mixture of dry edibles mixed with chillies, chutney, sweetened tamarind water, etc). “A round biscuit of chiki with water is an adequate, nutritious and balanced meal in the absence of normal food. It can be standardized into an industrial product. “The government should subsidize — that is, give a negative excise duty to — this standardized chiki. To do so, it will have to license chiki factories; it should ensure that they employ the most efficient, mechanized technology. As long as they meet the standards of technology and quality, there should be no limit on the number of factories; the number of hungry poor will limit the production. “If the government ensures the elimination of hunger by chiki, it will no longer have to buy millions of tons of foodgrains, give out billions in bribes, and bring prosperity to trillions of mice. And it will have a readymade solution for famine anywhere in the world; all it will have to do is to buy a few thousand tons of chiki and ship them to Bottomlessland. This entry was posted in Food, Issues and Ideas and tagged Ashok V. Desai, Chiki, Chikki, Churumuri, NREGA, Sans Serif, The Telegraph. Bookmark the permalink. This is for real. I can see the UPA taking this up and we will see chikkies everywhere, not just in Lonavla. I am only worried that the packets will have pictures of the living Gandhies. hmm… “let them eat cake, errr… Chiki”?? They should organize to serve Ragi Mudde in all areas for the BPL as they serve Idly in Tamilnadu under JJ scheme. I fully support the idea of processed food to ensure food security and as an answer to hunger and malnourishment. In due course, this will be followed by a Chikki-Scam of gigantic proportions and a minister/politician or two will be chucked [chickied?] out. Chikkies normally costing Rs.5 will cost 500, etc.etc…the possibilities are endless. This is all very good but starting an initiative to supply packaged drinking water to our thirsty millions would be a lot more useful. Soylent Green is the only solution to India’s malnutrition. If I were the Prime Minister of India, I’d roll-out separate currency for each state in India.